Does beat a 12-pack of napkin rings. Some gifts go beyond things for the couple’s new domestic life, because, as if this needs a reminder, the whole point here is to sell more pizza. 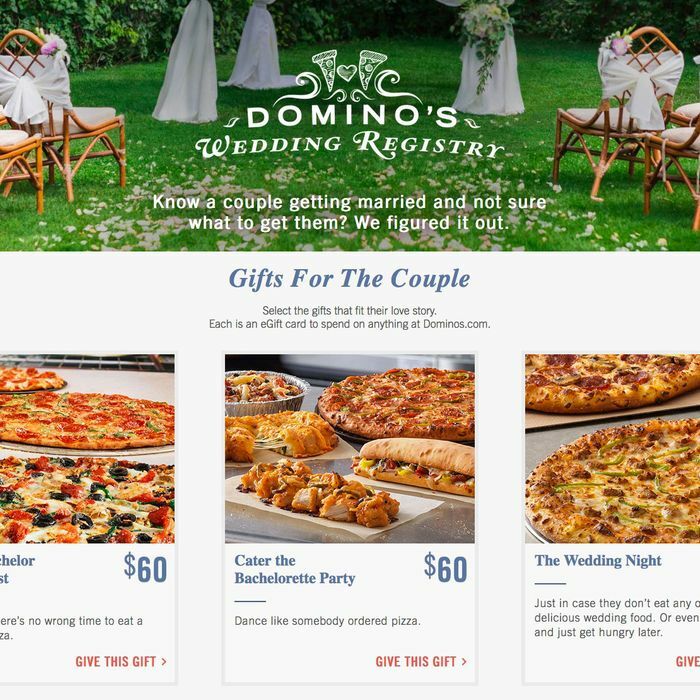 There’s a $100 reception package that includes brownies and chicken, and brides and grooms can get their bachelorette and bachelor parties catered by Domino’s. Still, the majority are combos slapped with cutesy names without getting very creative — they just encourage a lazy night in. There’s a Low-Key Date Night package described as “Cheesy pizza to pair with their cheesy movies,” or the Post-Honeymoon Adjustment to Real Life, which includes the chain’s three “new and improved” salads and one pepperoni-and-mushroom pie. Couples might end up without plates because they neglected Bed Bath & Beyond for Domino’s, but at least they’ll be together scarfing that hot pizza down as it sits on Aunt Trudy’s off-registry monogrammed baking sheet.